Get the best performance for multiple projects and clients! What is Reseller SSD Hosting? Looking for quality web hosting for multiple clients or projects? With reseller hosting you can create and manage accounts from one package. 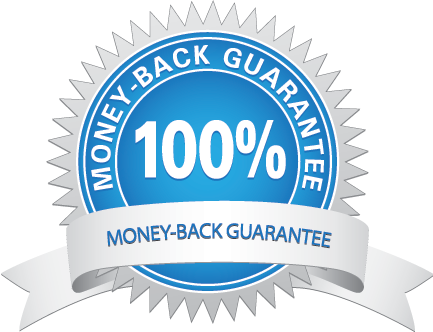 Reseller hosting uses the same SSD technology as our regular hosting plans. Start saving time and money with Reseller hosting or even make money! Create an on-going source of revenue from your web hosting customers. Brand everything as your own including control panel, welcome emails & more. Create your own hosting plans. It is completely up to you how you distribute your resources! All Reseller hosting hardware and software are managed for you! We take care of the really complicated stuff. This way you get to focus on your projects or finding clients. Are you a web designer? Hosting builds long-term relationships beyond the finished project! You can purchase domain names from us and benefit from our low prices. However, should you choose to do so, you can buy domains from any provider and simply point the DNS to your account. Price does not include VAT tax required for EU customers. Larger custom plans available, ask support. Check our affordable domain pricing. Customize welcome messages and place your logo’s. Create hosting plans with their own limits regarding Disk space, bandwidth, MySQL databases, domains, email accounts, ftp accounts, etc. Provide users with one of your subdomains to act as a “free” domain. 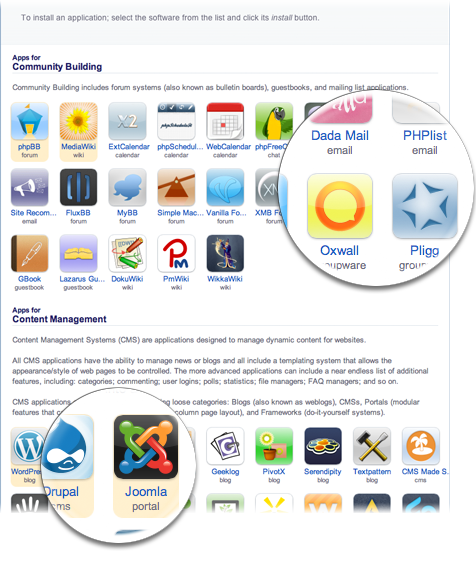 Create user accounts for your clients or your personal convenience. Enable or disable options like SpamAssasin, DNS Control, Suspend at limit, etc per user! With MySQL 5.6.x you can run forums, WordPress, Joomla, Drupal, and so much more! Working on multiple websites? Control them all from one a single hosting plan, save time, save money and make money! Offer your clients the best hosting experience with our SSD technology. Reseller Hosting is suitable for anyone else that has multiple websites. You save money on your hosting plan. More importantly you can give each website it’s own account but manage it with a single login! Installatron is a plugin on your DirectAdmin interface. It provides a ton of functionality. Most importantly it can provide one-click install and auto-update functionality. 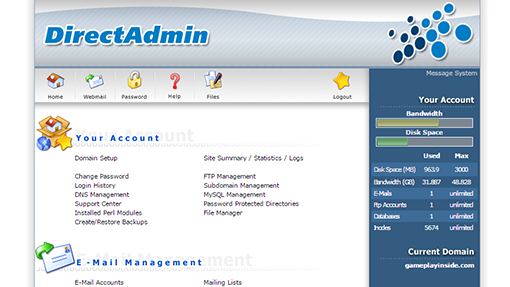 As a reseller you get access to the administrator level. Meaning that you can re-brand installatron and adjust it’s settings. It also allows you to update all your clients CMS’s from a single screen. As a reseller you get access to the “Reseller level” access level. 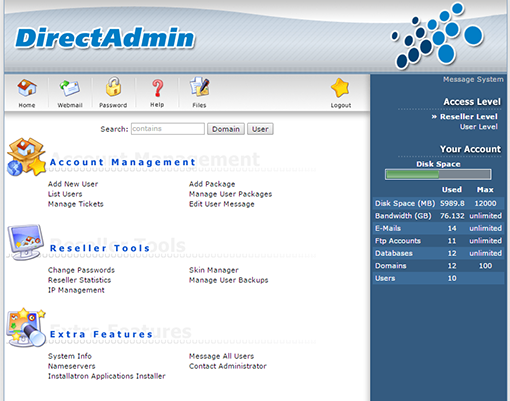 This allows you to add new users, create user packages, change passwords, message all users and customize user messages. You could even use the build-in tickets system. All accounts created can be accessed without entering passwords. So save time and hassle on maintenance!